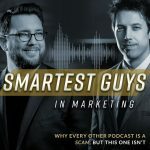 This is not your usual Smartest Guys in Marketing ™ episode. Today is an extra special podcast episode from a recent live stream with a client panel of two very fabulous business owners; Tory & Kevin. They crack open their stories, take questions asked by viewers, and share their success secrets from being in Client Kit ™. We’re going freestyle with this one and getting you some sustenance for your hungry soul! Previous post: How do you make a habit stick? Next post: Wish you worked more?